After completing three years of a law undergrad degree and a master’s from Leicester, Joe was pretty much ready to become a solicitor. Surrounded by friends on grad schemes in banking, and with the approval of his parents, there was no question that he’d chosen the right career path. However, after an internship, he was left unconvinced by what he had witnessed in the sector and wasn’t sure how much of a difference he could make. What were your original plans for after graduation? After my undergrad I got a scholarship to do my Master’s in Human Rights Law – I always wanted to go down that kind of route, trying to do something that helps people, so I jumped at the opportunity to continue my studies and follow that career path. I had my heart set on a career in antitrust law, but when I saw it in practice during an internship, I didn’t feel like I was helping people at all. It was strictly admin, without any face to face interaction or seeing the results your work could drive. It left me looking for other avenues outside of law as a whole as I didn’t want to invest all of that time and effort into something I wasn’t devoted to. What made you make the switch to working as a prison officer? I’d always been interested in the criminal justice system, but it’s a hard area to get yourself into and actually do something within. Unlocked came to my uni’s careers fair and offered the chance to be a prison officer straight out of uni. I was really interested but I already had my master’s sorted, and it felt like too big of a jump away from the straight and narrow for me to consider it. Luckily, the next year, I met someone from my law course who spoke really highly of the programme. She told me about the level of influence you could have and how closely you could work with the prisoners, which was something I hadn’t seen before. I wanted something more on-the-ground, that would mean I’d be making an active difference – so I took the plunge into the Unlocked scheme and never looked back. The team that I spoke to were super helpful. Obviously coming from my background, having no knowledge of this system, it was daunting approaching it. But I could speak to them at any point, so if I wanted to clarify anything it was really easy. From my experience, they welcome grads from all backgrounds and they measure you on your personal qualities as opposed to just what you have on paper. 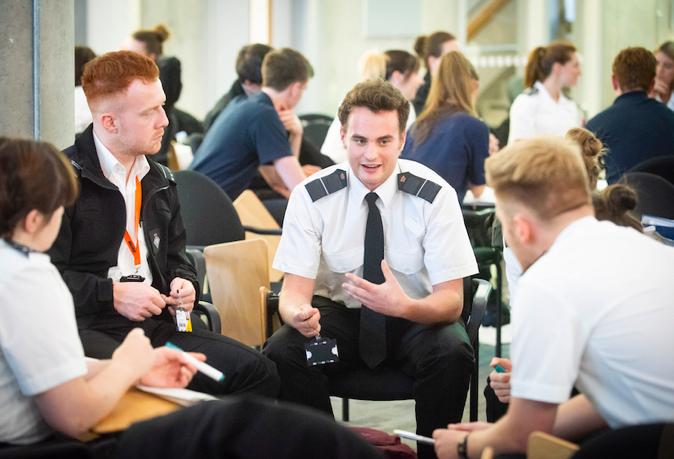 It was also more hands-on than any interviews I’d done before – it involved vocational roleplay and scenario tests, which I think is a testament to what they look for as an organisation. How did your family feel about you working in a prison, rather than a law firm? My parents were quite surprised to be honest. After I’d completed my internship in law and got decent results they thought I’d naturally become a solicitor. My other friends went into banking and jobs like that, so I can understand their confusion. Once they got to grips with how much I enjoyed it, and how aligned with my interests working in a prison was, they eased off. 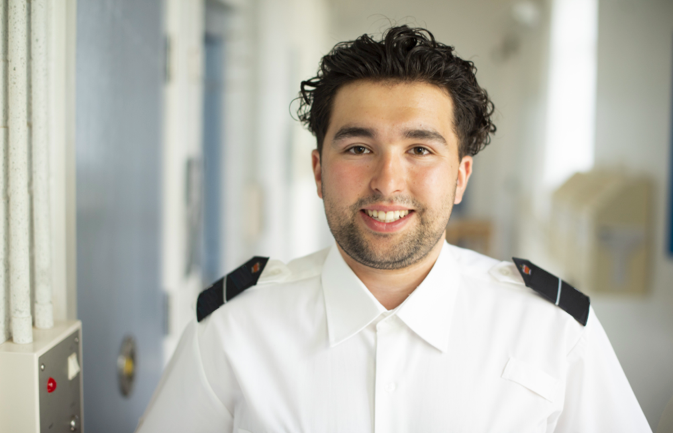 What was it like when you first entered the prison as a grad? The first day I turned up for the training period, I definitely underestimated the kind of stuff we’d be covering. You begin by learning about the different situations you could witness – like hostage-taking and self-harm. The first time you pick up your baton, you realise there is an element of risk, but those nerves soon get settled. There are six grads in my prison and we each work on a different wing which is ideal. With the prisoners I manage, whether I’m playing pool with them or having serious one-to-ones, I don’t think there’s a single person on the whole wing that I wouldn’t feel comfortable talking to or confronting about something. Has your perception of prison completely changed? The media definitely perpetuates this narrative that prisons are bad, and you only see them on the news when something negative happens. Even my perception of prison wasn’t the best before coming here, but I’ve had the opportunity to really see how amazing the inside of a prison can be. A lot of people make one mistake and end up here, so you can’t write everyone off. The British culture of prisons is quite forward-thinking and rehabilitative, which is something the public doesn’t consider. There’s a lot, but nothing you can’t handle. We only started in September as officers, with maybe a month and a half of experience there before we could manage our own area. Of course, you can have a lot of responsibility in other grad jobs, especially in something like law, but it’s good to know that the trust you’re given as a grad is going towards work that’s genuinely important to the prisoners’ lives. You also get a lot of leverage over what happens in the prison behind the scenes. We’ve already spoken to the governor about our different roles and there’s a lot of consideration for our proposals. I don’t think any other kind of grad scheme offers that much faith in their grads either. What does a normal day in a prison look like? Our prison is a bit different to others – the guys are out from 8am until the evening, which definitely goes against the conventional image of prisoners spending 23 hours locked in the cell. In previous years it was a juvenile prison, so a lot of the staff are well equipped at defusing confrontation and creating an environment that is pleasant for the staff and prisoners. On a normal day, it’ll be a pretty early start. We’ll make sure everyone’s accounted for in the mornings – most prisoners will be desperate to go to the gym so we’ll ensure this happens smoothly and then get them off to work afterwards. In the afternoon, they’ll grab their food and have recreation, which we’ll be monitoring. In our prison, a lot of the inmates are foreign nationals, so we’ve got to make sure that they’re getting in contact with their family. There’s some admin involved but we’re always working one-on-one with the prisoners. Do you ever feel like you missed out on the social side of other grad schemes? Not at all. 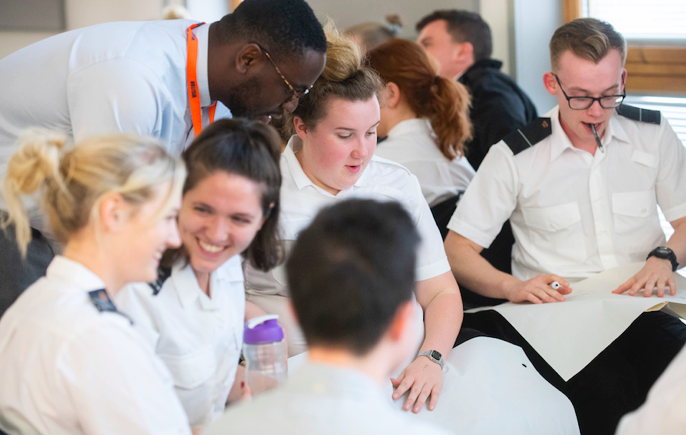 At Unlocked, you work so closely with each other during training and make some lifelong friends who you’re able to share your experiences of the job with. We regularly meet up for drinks and I myself live with the other officers. I get all the benefits of a grad scheme while making a difference – it’s a huge win. Honestly, it’s having the freedom to learn about the prisoners and hear their stories. We have an open door policy with the prisoners to try and instil less of a hierarchy here. We even arranged a football match against them and got absolutely destroyed. We like to think we’re all part of a big prison community. There is, of course, a challenging element to being a 22-year-old with a set of keys in charge of ninety grown men. Most of my friends thought I’d be eaten alive in here as I’m quite softly spoken, but I spend my days joking with the prisoners and they respect that. I don’t know anyone who gets this kind of experience after uni. What’s the flexibility like in comparison to a job in law, for example? At most entry-level grad jobs, there’s not a lot of variation between the sort of roles you can do. This scheme really tailors to what sort of work you want to do. Prisons will differ depending on location, which definitely plays a big part in your choice. I wanted to work with the older guys, and I also didn’t really want to live in London. I’m currently in Oxford, working with foreign national prisoners, which is perfect for me. There are also people working in the women’s estate and with young people. Do you see yourself staying in this industry? I personally would like to ride that boundary between my law background and the prison service, working on the policy side. 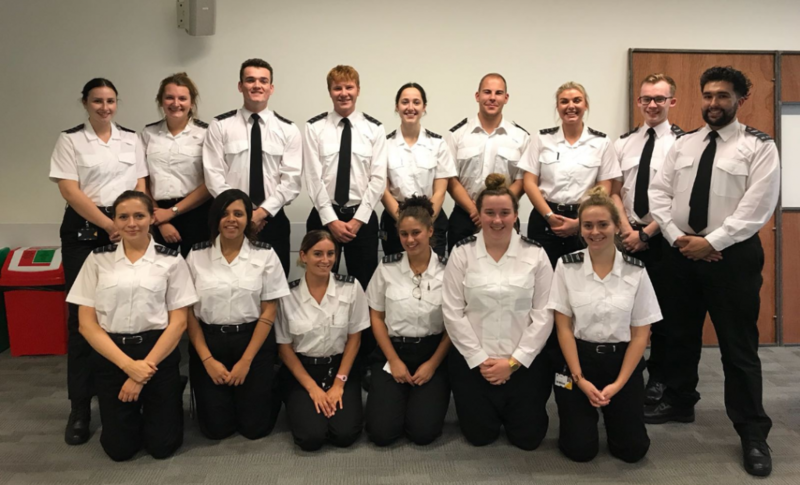 There’s an opportunity for the grads to work at the HQ in London, making the day-to-day decisions on the prison’s operation. By doing that, I’d be able to use my experience from my law degree and apply it to a field I want to make an impact in. Another benefit of this scheme is the number of options you have in this industry. 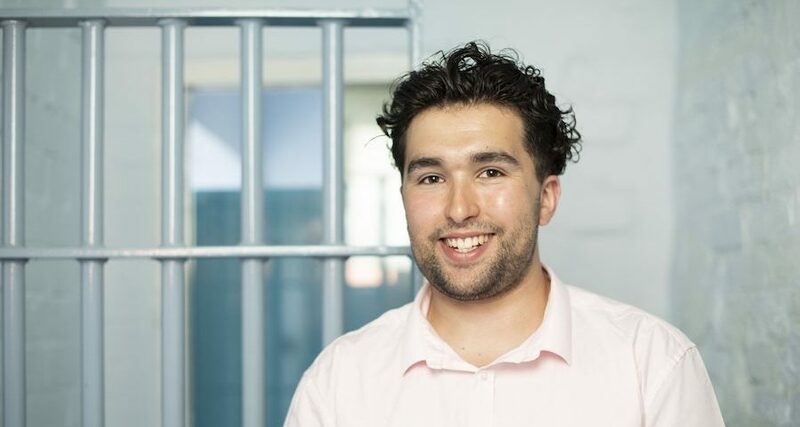 You can specialise in anything from sports, hostage negotiation, gang culture and more – I’m already signed up to do a couple of courses that the prison service are paying for. Had I continued in law, it would have been a pretty rigid route into becoming a solicitor. It’s nice to know that you can keep your options open throughout your career here. Why do you think more graduates should consider this for their next step, rather than another grad scheme? As Unlocked is a two-year programme, it can fit anyone’s circumstances. By the end, you’ll have a master’s degree and experience across the board, which you can take anywhere. I honestly don’t think I could have found something more suited to my interests – and I thought I had my career mapped out before this. If you’re open-minded, looking for a grad job with purpose but also stability, then I’d say it’s a no-brainer. The prison system is the forgotten public service and it’s an exciting time to be involved in it with the amount of investment coming in.